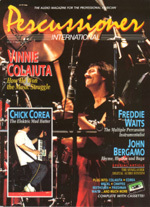 Vinnie Colaiuta is touring this summer in Japan. According to vinniecoliuta.com, the tour starts on July 1st and goes through the 13th. I won't be able to attend obviously, but for those in Japan, go see it! I found a great article on Vinnie's site about metric modulation or as Vinnie called it, "super-imposed metric modulation"
. Click Here to check out Vinnie's only lesson! The article is probably the closest thing to a lesson from Vinnie tha most of us will ever get That brings me to a topic a lot of people are probably wondering why he's not into the whole educator thing or why he doesn't do an instructional video. I give him credit for not doing one. He's the last of a dying breed of musicians that aren't temped by big companies to market themselves He knows he's a good player, he probably doesn't want to try and teach people stuff. What would you teach someone on a drum video? Steve Holmes' video Shed Some Light is a great video. I'm the type of guy that lets my playing do the talking. And Vinnie's probably has a similar attitude. At the same time, why would you give away everything you've learned & worked for? Look at Weckl, he's done 5 or 6 videos and how many Weckl clones are out there? A lot. What Vinnie does by not doing videos or instructional items is tell people that they should strive for creativity and originality.